Roulette has its roots in France, where it was first played in the 17th century. Today it is considered one of the most sought after games in Europe, with Monte Carlo playing as a hub. There are two versions to the game, the American which has 38 slots ranging from numbers 00-36 and European which has 37 slots ranging from numbers 0-36, so the only difference is the added two zero number in the American roulette. Roulette consists of a spinning wheel, with a small silver ball that is rolled in the opposite direction of the spinning wheel, and the table which is used as the betting area. The layout on the roulette table consists of two betting areas, one on the inside and the other on the outside. The inside consists of three rows with 12 numbers on each row, and the numbers 0 or/and 00 on the top. The betting outside area consists of columns to make either odd/even bets, red/black bets or dozen bets. Roulette has its own separate chips, which need to be purchased with cash chips, each individual is given different kinds off colored chips to avoid confusion when placing bets. Once a player is done playing he is required to exchange the roulette chips with cash chips before exchanging them for cash at the cage. 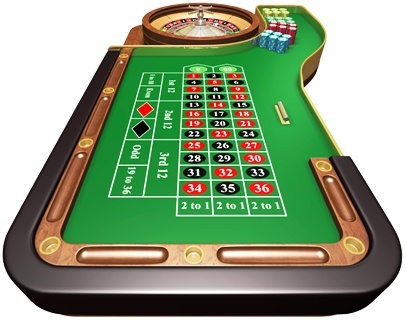 Each online roulette table and offline table has a betting limit. You will need to bet the minimum amount of bet to begin a game. You cannot add up the outside and inside bets to level up the minimum amount of bet. If the minimum amount is $3 then you cannot place a $1 inside bet and a $2 outside bet. House advantage on a roulette game is different for the American and European versions. On a single zero the house advantage is of 2.7%, whereas on the American version the house advantage increases to 5.25%. The highest house edge on a bet is basket bet which gives the house the advantage of 7.8% and is considered the worst bet in the game. There are primarily two kinds of bets, the inside and the outside. Inside bets basically consist of the number table, however there are different bets that you can place within the inside bet, and all have different roulette payouts types. In this bet you put a wager bet on any one number, this has the highest ratio of payout with 35 to 1. You can place your chips in between two table numbers, and thus bet on two different numbers with one chip. It pays 17 to 1. It is a three number bet and you make it by placing you casino chips on the table vertical line between outside and the inside betting place areas, this bet pays 11 to 1. This is a four number bet and you make it by placing your chip on the corners of four numbers you wish to bet on. It pays 8 to 1. It is a five number roulette bet starting from number 00-3. It pays 6 to 1. It is a six number bet and you make it by placing your chip between two rows on the table vertical line between inside and outside betting areas. It pays 5 to 1. There are three kinds of basic outside bets. These are called even money bets because they pay 1 to 1. You make these by placing a bet on an odd or even number, or on the possibility of a black or red slot. It is a 12 number bet, and you make this gambling bet by placing your chip on a 2 to 1 slot above the three inside rows. Hence you bet on the 12 numbers that fall on that particular row. These bets too consist of 12 numbers and also pay 2 to 1. The only difference is that this bet is made on consecutive numbers, either 1-12, 13-24 or 25-36. Numbers 0 and 00 are not included in the 12 numbers and thus you’d lose if the ball lands on either one of them. Roulette is a game of chance and regardless of how much you practice or analyze there is no way you can determine a pattern.